Image from last years discussion on Religion. Event: Is the LGBT+ Community Inclusive? 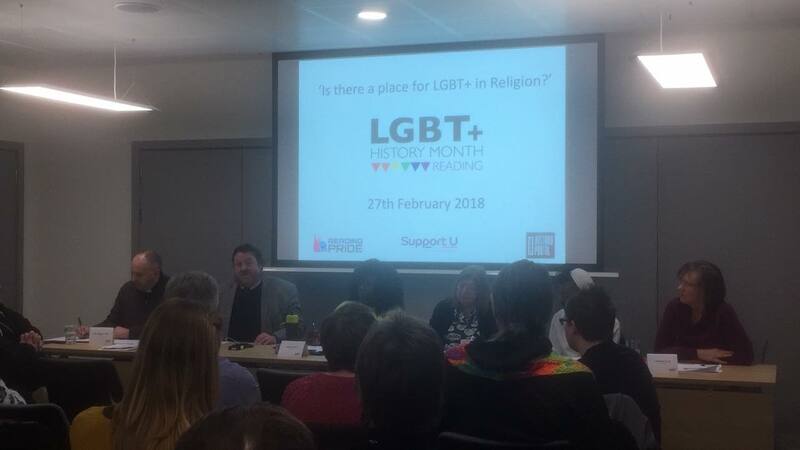 Last year we discussed if there was a place for LGBT+ in religion? This year we are discussing wether the LGBT+ Community is inclusive. If you have an opinion on this subject please come along or volunteer to be on the panel. As founder of Support U, Lorna brings a rounded view on discrimination and what that can mean to those affected by it. 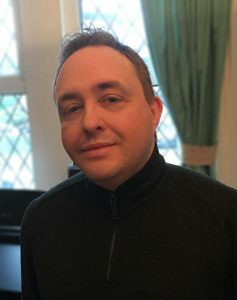 Paul Britt, Chair of Trustees for Reading Pride. Having seen the divisions within the LGBT+ community first hand, as the Chair of Reading Pride, it was important to me to help improve this situation. The division within the LGBT+ community is in some respects representative of the wider community as a whole. I am proud to have lead Reading Pride to tackle these divisions in a number ways to help join the different fractions of our community together, or to at least start the process. Our past achievements have included participating in the Reading Caribbean Carnival, inviting an Imaan to speak at our event to represent the Muslim community and our first open table service at Reading Minster, which I am pleased to see will be taking place again next week. Since I first starting campaigning (for the abolition of the Section 28), I have learnt that the LGBT+ community needs to be cohesive, inclusive and united to ensure that we don’t have just have equality in law, but that we have equality in the real world too. Sophia James, is the Lead Councillor for Neighbourhoods and Communities at Reading Borough Council. She is also a Trustee of Reading Pride and member of Reading Carnival Committee. Sophia has a long history of political activism which started in the student movement as a full time officer for Equality and Diversity, during this time she served on the LGBT, Women’s and National Executive of the National Union of Students. 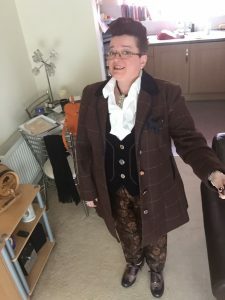 She is an anti-fascist, pro-liberation activist who has campaigned on a range of issues and taken part in a number of activities including organising LGBT and Black History Month events, protesting the EDL in Tilehurst and lobbying for equal marriage. Alyssa Henley, CEO for Support U, a vocal Trans Advocate and business woman, Alyssa brings knowledge of how the LGBT+ Community see trans people. 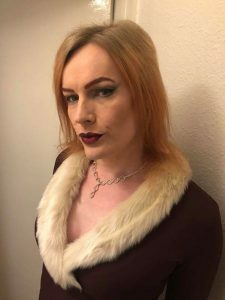 Zanya Ratty, Zayna is a specialist Hypno-Psychotherapist, Trainee UKCP & NCH, specialist in G.S.R.D, LGBTQIA+, QTIPoC, Consensual Non Monogamy, Poly, kink and fetish based in Oxford. She is a Stonewall PoC and Schools Role Model, who writes Mental Health, LGBTQIA+ and Intersectionality & Diversity training for Charities & Corporations. CEO of LGBTQ+Asylum, Chair and Executive Trustee of award winning charity OxFriend and Community Liaison Officer for Oxford Pride. Her newest project is as Oxford University LGBTQIA+ Support Group lead. An academic Board member and presenter at NCHP, Oxford University, T.V.P L.A.G.L.O, Polyday, Lets Talk Queer PoC, Brum Bi Fest, Reading LGBTQ+History Month and Oxford Pride Queer Panel Chair. Writes on proxemics, intersectionality, cultural identity, contributes to DIVA magazine, Cosmopolitan and is a multi mediadomain contributor on Mental Health and PoC issues. Chair of the Race & Ethnicity Panel at Pink Therapy Conference March 2019. 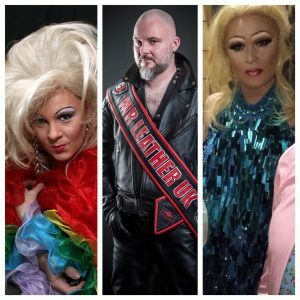 Jamie Wake, Jamie Wake, one of the founders of the Reading Pride Festival, LGBT Rights Campaigner, surviving husband of Selwyn Jones, former and now reincarnated Drag Artist Sue Panover, Mr Leather UK 2017 and deaf. Mayor of Reading, Debs Edwards, The Mayor has been a supporter for the LGBT+ Community for many years. She understands how discrimination can affect whole communities and the importance of unity within each community. 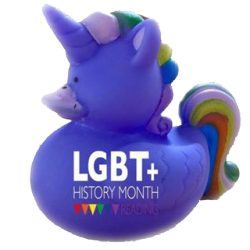 Reading’s LGBT+ History Month is brought to you by collaboration of the following Organisations in Reading.